Rev. James M. Demske, S.J. A Buffalo native, Rev. James M. Demske was a graduate of St. Joseph's Collegiate Institute (Buffalo, NY) and Canisius College. His education at Canisius was interrupted when he left school to serve overseas in the military during World War II. He returned after the war and completed his Bachelor of Arts degree in 1947, the same year he entered the Society of Jesus. He earned a licentiate in philosophy from Woodstock College (Woodstock, MD) in 1951; a licentiate in theology from the University of Innsbruck (Austria) in 1958; and a doctorate from the University of Freiburg (Breisgau, West Germany) in 1962. He was ordained to the priesthood in Innsbruck in 1957. After teaching philosophy at St. Peter's College in New Jersey from 1951-54, Father Demske studied in Austria and Germany for seven years. In 1963, he was named director of the Jesuit seminarians at Bellarmine College (Plattsburgh, New York). He returned to his hometown and alma mater in 1966 to serve as president and rector of Canisius College. During his years as president of Canisius College, his steady guidance proved critical to the college's growth and vitality. New academic programs strengthened the curriculum. Physical plant changes were most dramatic. Bouwhuis Library tripled in size thanks to an $8 million renovation. In the summer of 1989, a $4.5 million state-of-the-art outdoor athletic complex was completed. The long-awaited "home field" was named in honor of Father Demske in tribute to his tireless efforts on behalf of Canisius College. Eight new buildings, including two student housing complexes, were added to the campus to keep pace with the college's growing student enrollment, which realized a 70 percent increase in undergraduate and graduate students combined. Also under Father Demske's leadership, the college's endowment fund grew from $1 million in 1965 to over $27 million at the time of his retirement as president in 1993. Known for his scholarship as well as his leadership, Father Demske was a noted author, having published three books and numerous articles on a wide variety of topics ranging from metaphysics to a history of Canisius College. At the time of his death, Father Demske was in the process of publishing a book through the Western New York Heritage Institute entitled Ireland, O Ireland! Tales of Great Gaels, a collection of vignettes from Father Demske's travels in Ireland. He also had recently returned to the classroom, teaching a philosophy seminar last semester to juniors and seniors. Father Demske's contributions to the larger society have also been well recognized. He has held key leadership positions with numerous Western New York organizations including the Buffalo Philharmonic Orchestra, the Buffalo Fine Arts Academy, Buffalo Urban League, Hospice Buffalo, and Western New York Public Broadcasting Association. His guidance helped strengthen the Western New York area culturally and provided a broad vision for its future. 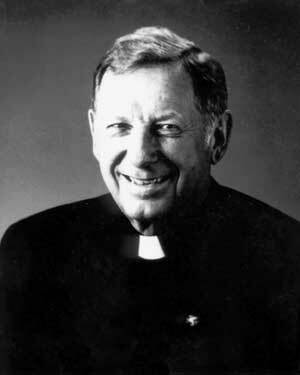 Among his many honors, Father Demske was named Outstanding Citizen of the Year by the Buffalo Evening News and Goodfellow of the Year by the Courier-Express in 1971. The Buffalo Area Chamber of Commerce recognized him as Western New Yorker of the Year in 1986 on the occasion of his 20th anniversary as Canisius' president. He received the St. Joseph's Collegiate Institute Signum Fidei Award as an exceptional graduate. He also was a Distinguished Alumnus of the Canisius College Board of Regents Distinguished Citizen Award. Well known for his avocation as a trombonist, Father Demske often performed at college functions and was a member of the Buffalo Jazz Association and the American Federation of Musicians.